How to remove index.dat files? Privacy Mantra keeps your computer clean from online and offline tracks. Most people are unaware of that every web site they have visited remains in the undeletable index.dat file, even after the Internet history and cache has been removed. Your system is also keeping information of executables you run, movies you watch and documents you open. Some of these prints can’t be deleted manually as they are locked by the system. 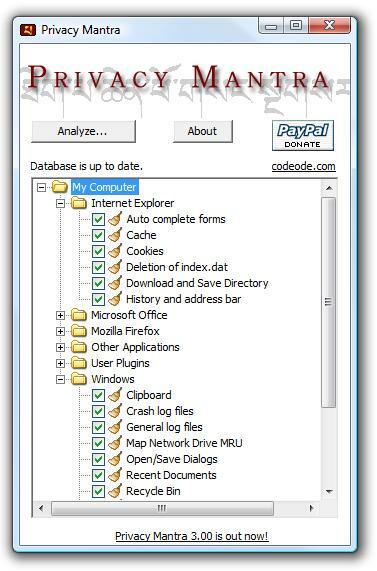 Privacy Mantra will erase and wash away most privacy threats in your machine including, Internet history, cache, cookies, index.dat files, auto-complete forms, search assistant, recent documents, open/save dialogs, run files, Mozilla Firefox, Google Toolbar and more. Privacy Mantra allows the user to easily download the latest database of threats. This reliable cleaner will not only protect your privacy but also free disk space by deleting junk files. For maximum flexibility you can also create your own cleaning plugins and download others. Privacy Mantra is Windows NT/2000/XP/2003/Vista/7 compatible, support for 32-bit and 64-bit operating systems. To see a list of all tracks Privacy Mantras cleans, please click here. privacy [praivEsi] a) the quality or state of being apart from company or observation. b) freedom from unauthorized intrusion. mantra [man’tra] a mystical formula of invocation or incantation. code [kaud] the symbolic arrangement of data or instructions in a computer program or the set of such instructions. ode [aud] a lyrical poem with complex stanza forms.